As I have mentioned before, we are in the throws of a complete playroom overhaul! Everything that was currently in our playroom is now crammed in every nook and cranny of the rest of the house! It is driving me crazy but I know in the end it will be worth it! We are currently about halfway through the renovation. When we get back from vacation, it will be time for paint and carpet which will be followed by the fun part – the decorating!!! The previous owners built this room by closing in the existing carport (hence the brick and that weird half-door thing). It is our guess that the house was foreclosed shortly after completing the room as it was never quite finished. When we moved in we slapped on a coat of paint as our focus was the primary living spaces (kitchen, living room, etc). So we are really glad to get this process going! 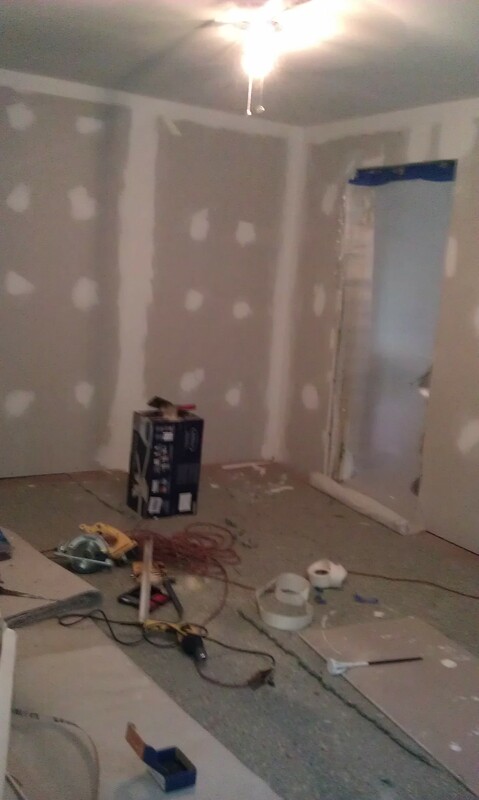 We have sheetrock! No more brick or weird doors! Nice smooth walls! While we are gone, the sheetrock will be completed, trim will be installed, and a new light fixture will be mounted! Score!!! And yes I totally realize that I have completely overused exclamation points! Every day Abby goes to the doorway and peeks in at the progress of her room so we cannot wait to once again have a place to play and for the family to hang out together! We picked out paint & carpet today so we’ll be ready to move forward after vacation. Next up, a trip to IKEA! That’s pretty good progress. I can’t wait to see the finished room. Enjoy your vacation! Hopefully within 2 weeks we’ll be ready to decorate! They made awesome progress while we were gone! We’re getting so close! Wow…looks so much better already! Can’t wait to see the end result! I need to go to Ikea…have only been there once as the only one around here is over an hour away…but I bet you’ll find great stuff to decorate a playroom there! The closest Ikea to us is also over an hour away but you can’t beat their prices when it comes to storage solutions! They made amazing progress while we were gone so hopefully within 2 weeks we’ll have paint & carpet down! Ooh! Looking good! I’m envious of your impending IKEA trip. I keep the IKEA catalog on my bedside table and go through it every few days to make a new wishlist.